View More In Urinary Tract Infection Tests. Is it really a UTI? Trust the same type of UTI tests that many doctors use! Treating a urinary tract infection early is the key to fast UTI relief and preventing more serious problems. 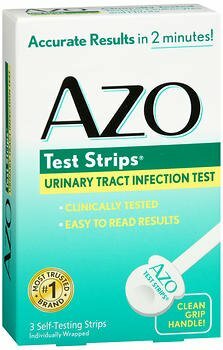 With AZO Test Strips, you can take a UTI test at home safely and simply, then call your doctor with the results. The same type of UTI tests that most doctors use to diagnose a UTI. Two tests in one - including both Leukocyte (white blood cells) and Nitrite tests - both tests commonly used to diagnose a UTI. Accurate test results. Test results are ready to read in just two minutes. Clean grip handle is sanitary and easy-to-use! If you have any questions about this product by AZO, contact us by completing and submitting the form below. If you are looking for a specif part number, please include it with your message.